frankly my dear...: For the Boy. Yes! I do have a boy.....hehe. He's not actually here right now, he's having a holiday with his Nan & Pa.......gosh i miss him! 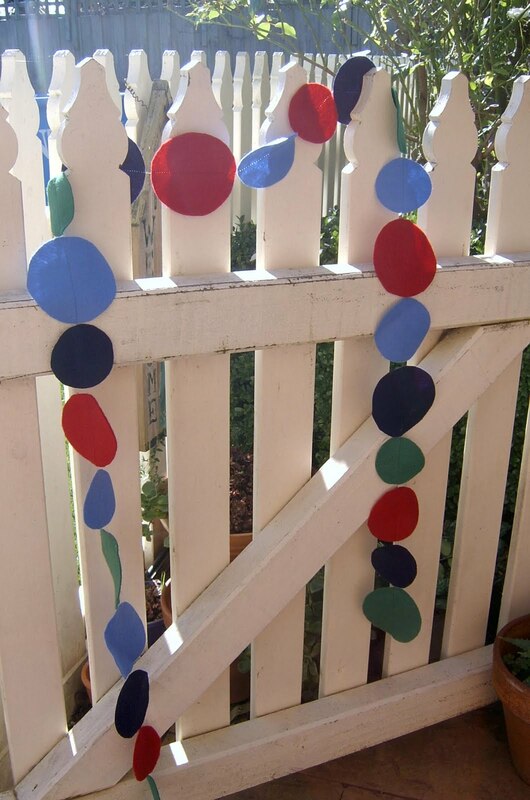 But here is something i made for him the other day - a felt garland to hang above his bedroom window. I planned to make this ages ago, we picked the colours out & they just sat in the cupboard for too long. I really should've done it sooner, because it honestly took no time at all. Sorry about the crappy photo - it was actually quite tricky to photograph. I made it by simply cutting three different size circles from the four felt colours & then machine stitched them all together with invisible thread. Easy peasy. I'm thinking these would look lovely as christmas decorations too........but who wants to be thinking that far ahead already? great garland! I bet your little man is having a lovely time. What i am doing - In April.